IT'S HERE! IT IS TIME TO GO SOON! Yep, tomorrow we head out! We board this big bird and head to Europe. First we drive to Cincinnati, Ohio. From there we go to JFK. Then from there we land in Prague! WOW. House sitter is lined up, kitty taken care of, mail taken care of, pool closed for the winter - all systems go! First day of business in Prague will be getting settled in at the hotel. Next will be to prepare for the second day. After our touring we will work on preparations for our first structured class! 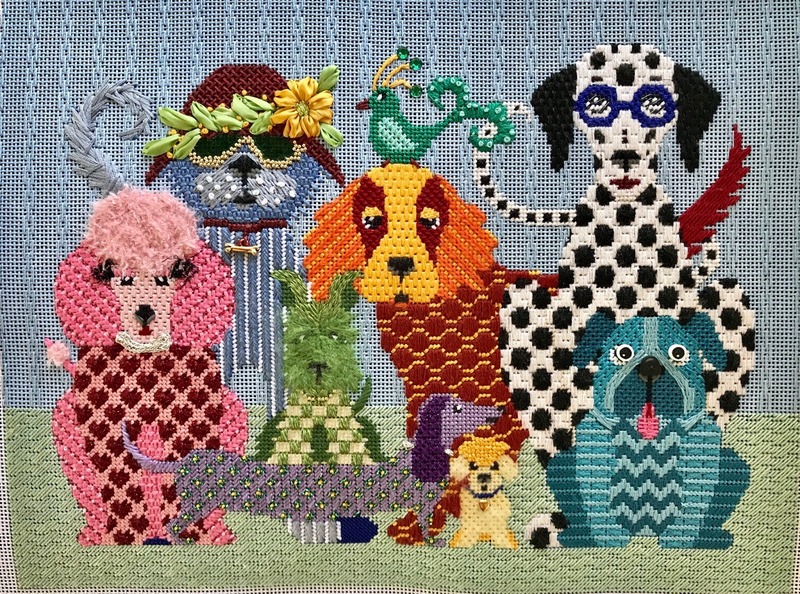 This is when we all get together as a stitching group, meet each other and get to work. This is also when I get to let go of lots of 'stuff'! Stay tuned! We'll try to share on our FB page as much as we can. Mother Nature has forced our cruise line to make some changes in our Itinerary. While it is a bit disappointing, it is still exciting for me. I have never been to the areas we are going to visit and I look forward to seeing all new sights and experiencing the unique surroundings. 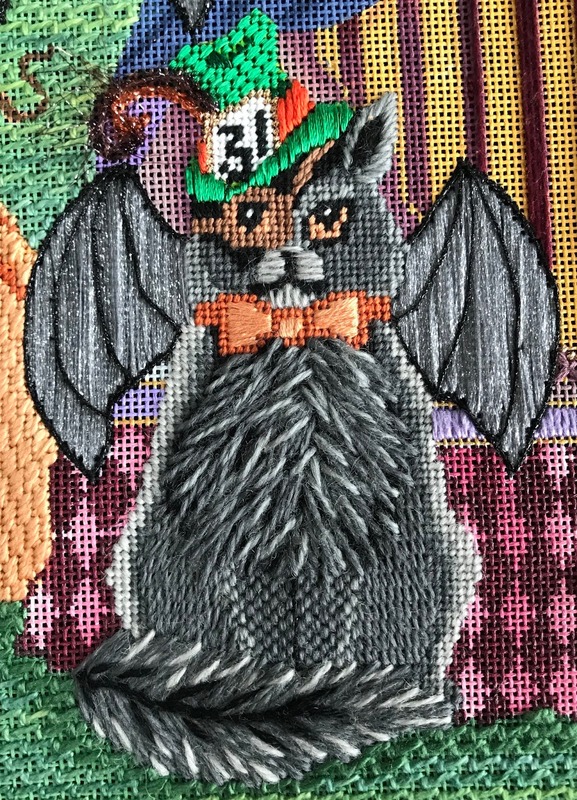 Of course, there will be stitching as I go as well! 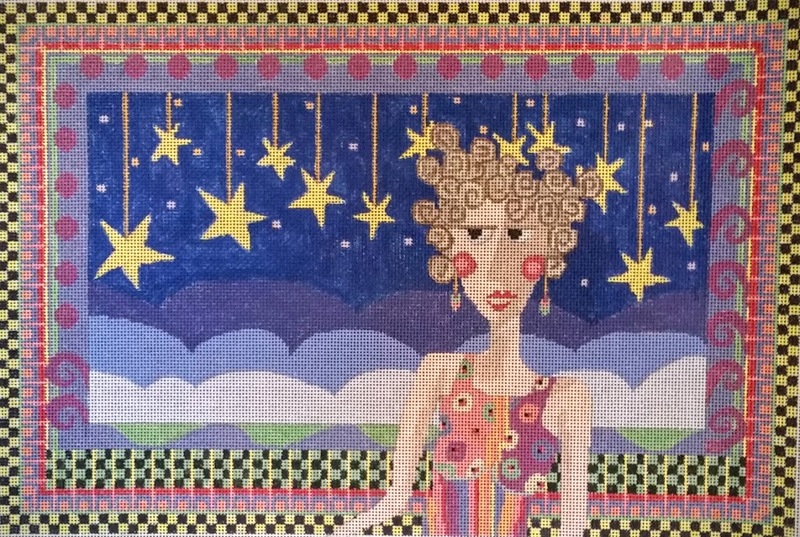 Reservations are being made for our October 2019 cruise - Mediterranean Stitching Memories. This is a slightly larger vessel (640 +/- still intimate) because we'll be on the Mediterranean Sea. Reserve early to get your preferred stateroom. Just email our agent Liz (lwolak@vikingtvl.com) for details. Also request a copy of the brochure if you don't see one. It is posted in the files section over on Needles 'N Fins Stitching Adventures Facebook page. Mercy! Here we are at mid-month once more. That means we had such fun sharing more lessons for the selected designs. 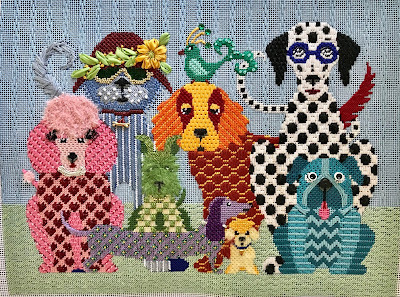 This month we say goodbye to Dog Gone Good by JP Needlepoint Designs. These cuties were such a joy to stitch. 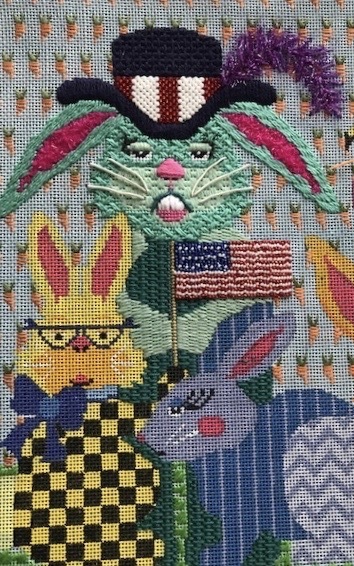 Beads, ribbon, fuzzies, lots of stuff that I love to include when I stitch. I love happy, colorful pieces to work on. We also say goodbye to Steampunk Witch from Brenda Stofft. This class and one other were experiments into trying lessons every other month instead of every month. While it was kinda nice in one way, it was not much fun administratively. We won't be seeing many more of this type class in m future. The Reindeer Series from Raymond Crawford had us sharing the second lesson on the reindeer with the Candle on the Blanket. 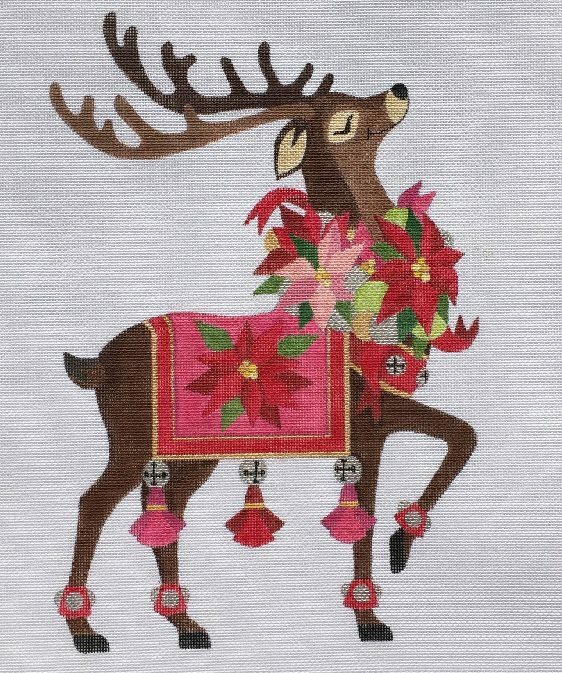 This involved stitching the reindeer in a similar manner to the previous ones. Christmas Stars 12 Days of Christmas fun series from Raymond Crawford had the athletic Ten Lords a Leaping - although only one came forward. 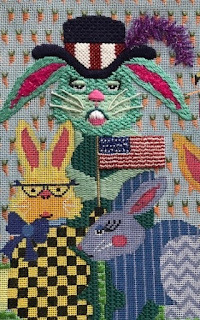 Next is the fun design of Every Bunny Needs Some Bunny from JP Needlepoint. This is our second lesson on these cuties. Remember that registration is ongoing for all the upcoming classes so be sure to email me at duodesignsinc@yahoo.com if you are interested in joining some of them. The agenda link is in the right column at the top. The most active at the moment is the Penny MacLeod Dana - Life of the Party. 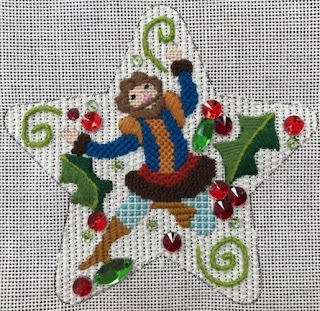 Such fun planning the threads, stitches and embellishments. Just email us if you want to participate - still plenty of time as the first lesson will be mid-January. 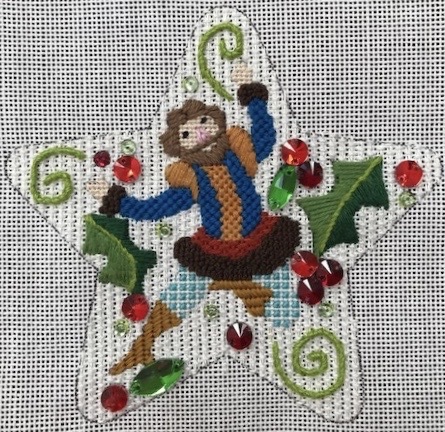 The shop has the optional thread/kit and embellishments details ready for those that need assistance. Wait until you see her hair! I'm not sure if I will be able to make a blog post next week - hard to tell what I will be doing so don't get mad at me if I post a short one or maybe miss altogether! I'm hopeful that I can get some pictures to share but we'll see. We'll be sharing what pictures we do manage over on our Facebook page Needles 'N Fins Stitching Adventures. If you do not follow go join in now. We'd love to have you. In just one more week we will be leaving for our Stitching Down the Danube stitching adventure! Preparing for this journey has been so much fun and going on for over a year and yet it feels as if we just left Party on the Po in Italy and only started planning for this year. I love this part! Once I lock the front door and head out it will be all fun for me over the next couple weeks. The hard work is over. I hope my participants feel it has been time well spent! I am tying up loose ends. Getting those last bead packets put together. 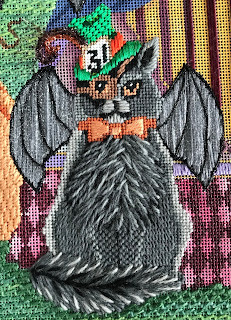 Taking some extra threads, etc., just in case, making sure I have something to stitch on myself. For hubby the most important thing is to be sure he has snacks! Working on the "make sure" lists this week: medications, chargers, cPap, needles (stitching kind that is), scissors, more needles, etc. 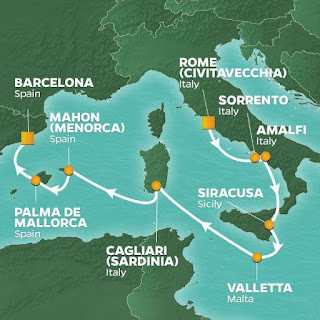 While this is all going on, there is a great deal of activity over at the travel agency setting up reservations for our Mediterranean Stitching Memories Cruise 2019. We are keeping our Miss Liz hopping! This fantastic cruise has been so well received. We are very excited. October 24 to November 4, 2019. We are also able to make plans for 2 extra days in Rome - where the trip begins - and 2 extra days in Barcelona - where the trip ends- for those interested. There are some very exciting ports of call and the beauty that is in store for us is unbelievable! I know that a year away sounds like lots of time however there is much to do in preparation to make it a very wonderful Memory. 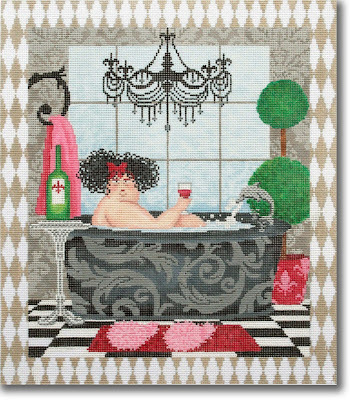 My mind is going around and around with design ideas for the exclusive optional needlepoint class. So much to choose from! Then, there are the little extra surprises I try to develop as well. 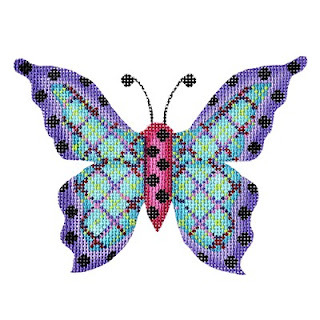 I have some that are already wanting to know what we will be stitching! I gotta get the Danube behind me before I can really focus on for this new adventure. That does not mean that it is not whirling around in my head though. Wish these techies would come up with a device that you could look into and specifically direct it to transfer certain data (such as sketches in the mind) over onto paper! Wouldn't that be cool. But it would need to be so that you could restrict what it sees in your brain - wouldn't want all that stuff up there on paper - ye gads! Our ship is a beauty! She holds approximately 650 - YAY! I don't care for the larger ships and try to avoid them whenever I can. I taught on my last ocean cruise ship about 5 (?) years ago and have never looked back. The intimacy of the smaller group is so wonderful. We have developed some fabulous friendships. But that is not difficult when we all share the same passion and speak the same jargon! Our first lesson in the Penny MacLeod - Dana Life of the Party - what fun she is developing into! Oh, and we are having custom ornament stands created for this series for those who desire to make them stand ups. More on that later. I have seen the prototype - so excited.